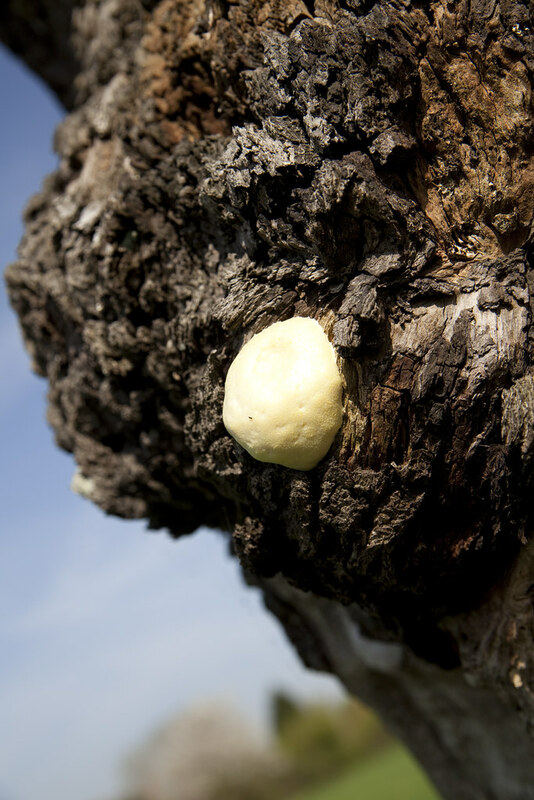 A very odd species which looked exactly like the expanding foam used in cavity wall insulation oozing from the bark of a very old and recently dead perry pear tree. Thanks to user Fenwickfield at iSpot I now know that this is Slime Mould Reticularia lycoperdon previously classified as Enteridium lycoperdon. Slime Moulds are a strange class of amoeboid protozoa, previously thought to be fungi but now known to be Myxomycota, which are organisms which prey on microbial food webs. This particular species is a bacterial predator and usually very tiny and unlikely to be seen, but this particular stage of it’s life cycle is a fruiting body known as a sporangium. 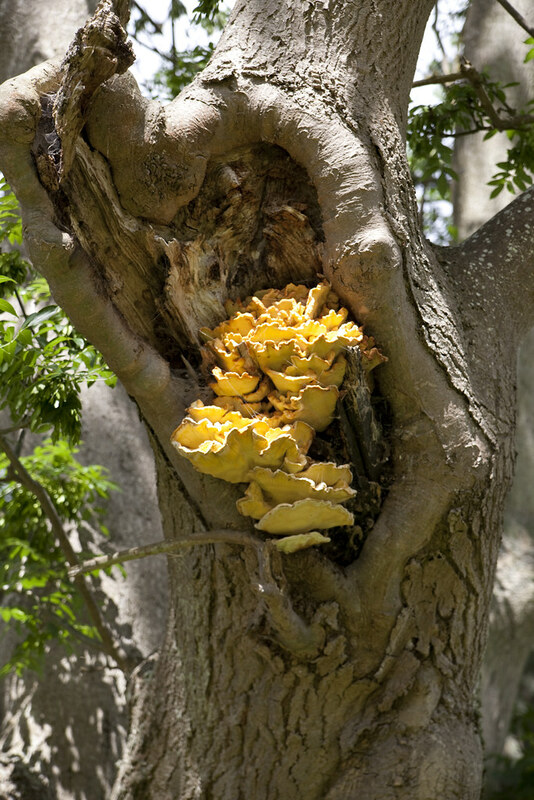 This is a globular formation which swells up to around 50-80mm (this was near to the top end of that scale), whereupon it hardens and then eventually splits to release brown mass of spores. I’ll try to return and take a few more pictures to illustrate more fully. A beautiful bracket fungus with a peculiar name. Personally, I don’t recommend you eat it this species of the day, but if you did, apparently you’d find the texture to be very similar to that of chicken. The Sulphur Polypore or Chicken of the Woods is usually considered to be an edible species, but does cause gastric problems, nausea and dizziness for a minority of people. For those who are brave enough to try it, experts recommend eating a very small piece of a young specimen before any serious consumption. The classic toadstool, and as such surely familiar to all through it’s numerous references in popular culture. Whether its peeking out of the undergrowth beneath fairies and elves in book illustrations, or dancing around in Disney’s Fantasia or even appearing as a playable character in Nintendo’s Super Mario Brothers games, it highly likely you’ve seen it before, or rather, you’ve seen a representation of it before, but in truth, it’s actually not that hard to spot in the wild, particularly over the next few months, here in the UK. Its quite a cosmopolitan species, most frequently found alongside birch trees but also with pine and spruce, so you should be able to find favourable habitat without too much difficulty. They start off as lumpy little white buttons then, as they swell, the white membrane splits and the familiar rich, shiny, red shows through. 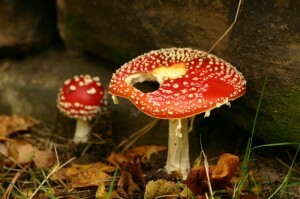 As the toadstool grows, the membrane fragments and becomes widely scattered across the cap. It’s not very strongly attached though, and can be washed off in the the Autumn rain. This can lead to it being mistaken for other edible species of Amanita in Southern Europe, but there’s nothing quite like it in this country. 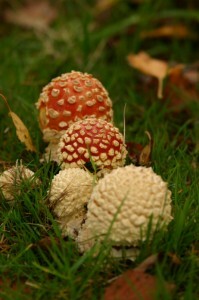 No one seems absolutely sure where the name Fly Agaric comes from but one school of thought is that it used to be used as an insecticide, another is that a peculiar quirk of its hallucinogenic properties led users to believe they were able to fly. My personal favourite though is also connected to its hallucinogenic properties as it was believed that madness or even divine possession was a result of a fly entering a persons ear. Whimsy aside, its a pretty breathtaking species and I highly recommend it as my species of the day.